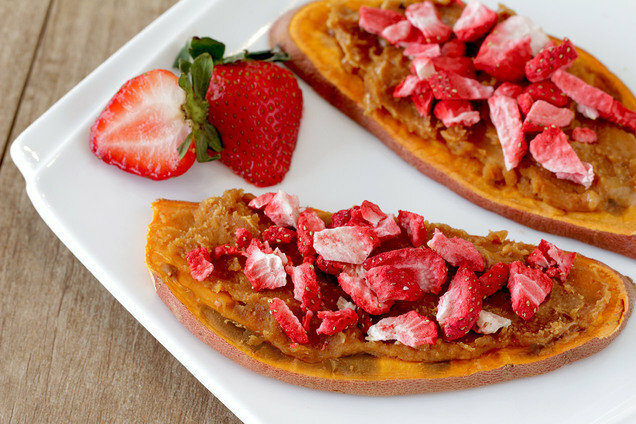 Wrap sweet potato slices in a paper towel, and place on a microwave-safe plate. Microwave for 1 minute. Place slices in a toaster. Toast until cooked through and slightly crispy, 2 - 3 times. Meanwhile, in a small bowl, combine all remaining ingredients except freeze-dried strawberries. Add 2 1/2 tsp. water, and stir until smooth and uniform. Spread peanut butter mixture over toast. Top with freeze-dried strawberries. Hungry for More Healthy and Unconventional Toasts? Keep this toasty train rollin'! Click "Send to a Friend" to share the recipes.